This collection of Healthy Dairy Free Smoothies has something for everyone! These easy smoothies use fruits and vegetables to make delicious drinks for snacks and breakfast without dairy products. I love smoothies, but I prefer them with dairy products like yogurt and milk. 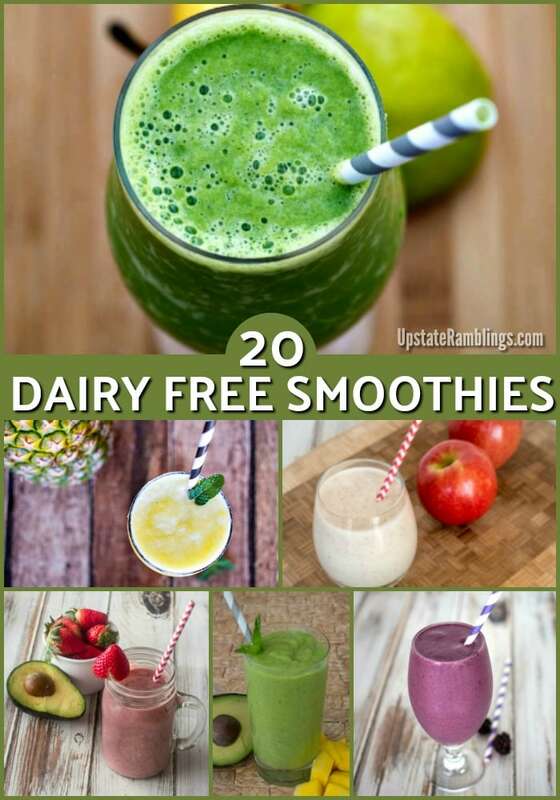 So I put together this collection of 20 healthy and tasty smoothies that you can make without dairy products. Smoothies are perfect for adding more fruit or vegetables to your diet, and they are quick to make too. Some of the smoothies in the collection like the Simple Apple Smoothie use milk substitutes like almond or coconut milk. Others like the Mango Avocado Smoothie are made with only fruits and vegetables. I am working hard at eating better this year and I am trying to include new foods in my diet. Smoothies are a great way to do that! Playing around with different tastes and combinations is part of the fun of blending up a smoothie. Let me know your favorite smoothie ingredients! This is a great collection! I had to be dairy free for so long because my kids had MSPI, but I find that I now prefer smoothies this way even when I can have dairy again. Thanks for this amazing list! I’ve been looking for awesome smoothie recipes without milk or sugar, can’t wait to try these! Those look great. We have some dairy free people in our house! Thanks for posting and sharing this on Merry Monday. I can’t really drink dairy since it doesn’t agree with me, so I need these recipes. These sound so derful!. We have a smoothie everyday! How do I get the 20 actual recipes?? Thanks so much. This is gold. My doctor advised me to take more smoothies for GERD and I am running out of ideas. Would love to try them all. Thank you for sharing.